Tonight, the group pictured above (that will eventually become the Spokes Council) approved the People’s Library as an Operations Group. This didn’t happen at the General Assembly (GA) and it didn’t happen at the Spokes Council, because there isn’t a Spokes Council yet. If this is confusing, you’re not alone, so read on for some clarification. 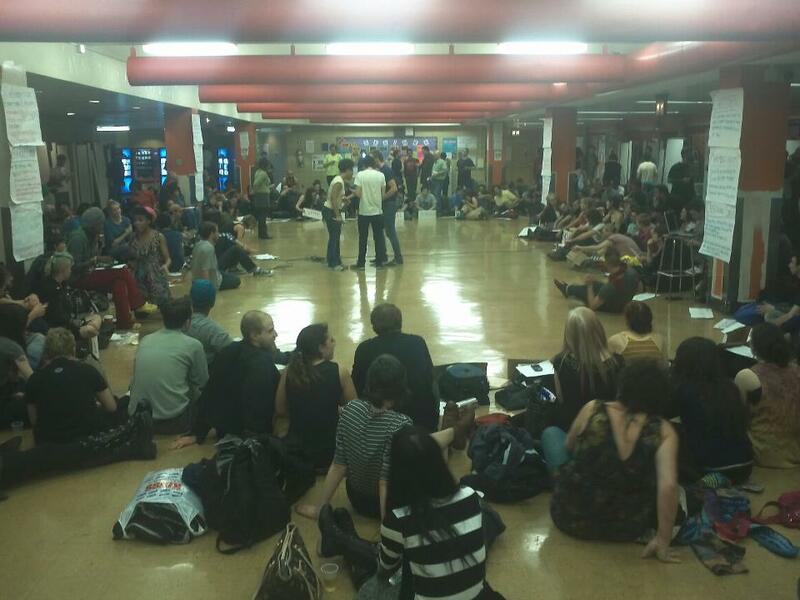 The continuing growth of Occupy Wall Street has resulted in our GA approving a proposal from the Structure Working Group to create a new body in addition to the GA. This body is called the Spokes Council. 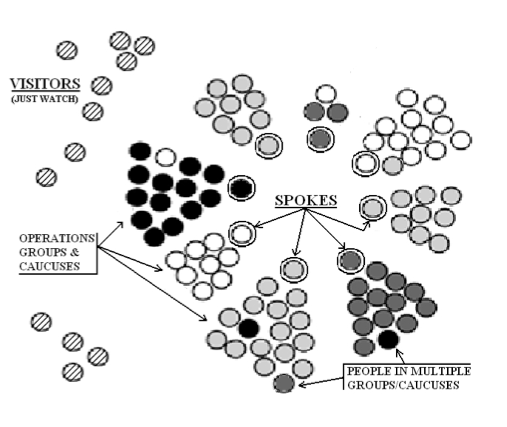 The Spokes Council is to be made up of Operations Groups and Caucuses. Other groups involved in the movement will be called Movement Groups. Tonight was the second meeting of the group that is determining which groups are Operations Groups. This group that met tonight is not a GA and it’s not yet a Spokes Council. Because it sits in this indeterminate space between these two decision-making bodies and is tasked with the creation of a new body, it is acting with what I might call an extra-legal authority in order to create new structures. This has, understandably, resulted in a lot of confusion – and the meetings reflect this. For example, tonight the Structure Working Group withdrew themselves from consideration as an Operations Group. And during the meeting folks from facilitation enforced certain rules that apply to the Spokes Council, while stating that we were not yet the Spokes Council. At one point facilitation said that the meeting was a GA, to which the Direct Democracy working group replied “No, it’s not.” And it wasn’t a GA, nor was it spokes – hence some of the confusion. The current meetings that are being referred to casually as spokes meetings, are actually meetings tasked with determining which groups fit this narrow definition of Operations Group. Tonight, our Library was approved as a group that does meet this definition. The Archives Working Group, however was not. There was quite a bit of discussion about whether or not groups meet these criteria. There was some contention, for example, about whether Finance meets this definition because they can exclude people based on background checks and this could be seen to conflict with the third bullet point above. But this was, of course, a matter of interpretation and the counter argument was presented that they don’t exclude membership based on those background checks, but rather exclude individuals from playing certain roles based on them. Many other issues were brought up, and I don’t intend to erase those issues by not reporting them here. In the end Finance was also approved as an Operations Working Group. I could write quite a bit about the different objections, confusions, tensions, structural questions, facilitation issues, and more that this process is bringing up, it’s a fascinating area. But for now, it’s enough to say that once the Spokes Council is formed and this process of determining group memberships is complete, the Library will be participating as an Operations Group. We will have a rotating spoke, a different person who speaks for the group at each meeting – and all library folks are invited and encouraged to attend and participate in the discussions and to volunteer to take on that role of being the spoke. You can read more about the Spokes Council proposal on the Structure Working Group page here. And please post questions, both specific and general, several of us have now attended these meetings and are familiar with the process and should be able to give you some different perspectives.